“It is now almost five years since civil war in Syria sparked the world's greatest humanitarian crisis. Teams from UK based ShelterBox have worked tirelessly to get aid to thousands of refugees and internally displaced families. With a long term presence in four countries, now the charity is focusing on two fronts - in neighbouring Lebanon, and via a route into Syria itself. 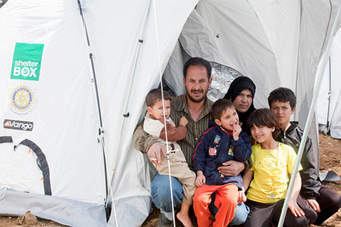 ShelterBox is currently working in or through four different countries, assisting some of the 2.5 million Syrian refugees who have fled the country, or channeling aid to 6.5 million internally displaced people (IDPs) left inside Syria. They are working with trusted and proven local and international partners to distribute aid inside Syria itself. It is a privilege to be able to reach out to vulnerable families to help them start rebuilding their lives. This simply would not be possible without the support Rotary club members have given us. Original generation time 1.6709 seconds. Cache Loaded in: 0.0125 seconds.